The de Lacy Marcher Lords. Baron's of Weobley. In recognition of their major part in the conquest, King William I. awarded Walter de Lacy, and his firstborn son Roger, Manors throughout what is now, Berkshire, Gloucestershire, Worcestershire, Herefordshire, Shropshire and even as far as Chester. ​With many areas of England either reluctant to accept or in open rebellion against Norman rule. William realised that to contain or even conquer the Welsh he would have to follow the pattern used by the Saxons to keep the Welsh from Marching on Mercia. They became known as the Marcher Lords. They raised their own army’s. Created their own laws and Courts. Levied their own taxes. They held rights to create forests, markets and boroughs. The Castles they built were in their names, not the Kings. In return, they only paid allegiance to the King and the Church. As subjects, to the English King, they were bound to support him in times of war, No other Norman Lords throughout England had such power. King Williams gain was the Crown was saved the high cost of protecting England from the Welsh. Earl William FitzOsbern, had become Overlord to Walter and Roger de Lacy and created them as Marcher Lords in their own right without having to be subservient to him. They had already been given many Manors throughout the West by King William who was pleased to create Walter as the 1st Lord of Weobley. Earl William then spent most of his time as Overlord of the Isle of Wight. Walter de Lacy as the first Baron of Weobley had been granted full Marsher Lord status. 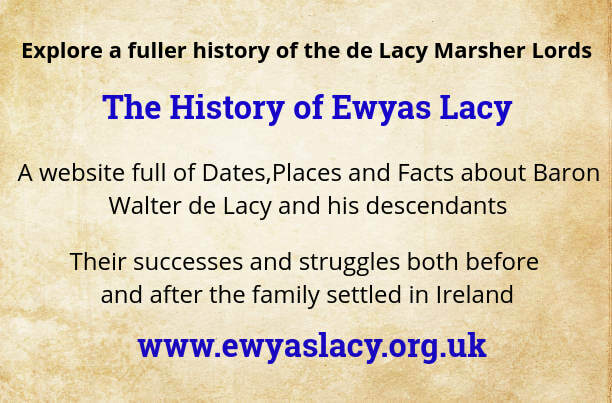 The de Lacy family were truly Marcher Warlords! ​Some may say "War Lords"
​This picture encompasses very much the 11th century landscape of the area. Mountains, Thick Forest and March land. The Normans had to come to terms with all three. To protect themselves and their men. In order to both protect themselves when advancing or defending themselves against the Welsh forces. The Welsh Marcher Norman lords built more Motte & Bailey Castles then anywhere else in the country. Many built by the de Lacy’s Barons of Weobley. The Normans had added the principle of building Motte & Bailey Castles as the essential part of their plans for conquest. Ideally, there was a castle within one day's march of each other offering defended shelter. Once built they only needed a small detachment to protect them.